The findings here also belie the idea that Obama enjoyed the most positive coverage, or that the press has somehow gone easier on him than on Clinton during the primaries. In the roughly 10 weeks studied, the former first lady had just as much success in the press as her rival in projecting the narratives she wanted about her personality, history, leadership and character: Fully 67% of the assertions about her as a person were positive, versus one-third ( 33%) negative—numbers almost identical to Obama. Clinton had the most success projecting the idea of her preparedness to lead the country—to take the 3 A.M. phone call as her well-known ad proclaimed. A full 38% of all character assertions spoke to this trait. This message was much more clearly asserted than any other about Clinton. The next biggest personal theme about Clinton in the media was a rebuttal to the idea that she is unlikable, a criticism that has hovered over her since the 1992 campaign. The Clinton camp fought this claim head-on in early 2008 and managed to create more presence in the press of the refutation than the original criticism itself. 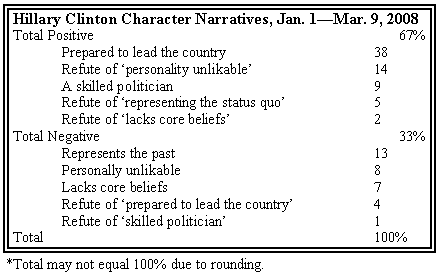 Rebuttals of this assertion accounted for 14% of all character threads studied, nearly double that (8%) of those proclaiming her unlikable nature. The negative theme about Clinton most evident during the key primary season was the idea that she represented the status quo. This narrative, which developed largely as the contrast to Obama’s promise of change, was the third-biggest character thread about Clinton, filling 13% of all the character assertions about Clinton studied.